Shamha Vibration is a Community Interest Company based in Brixton, South London. 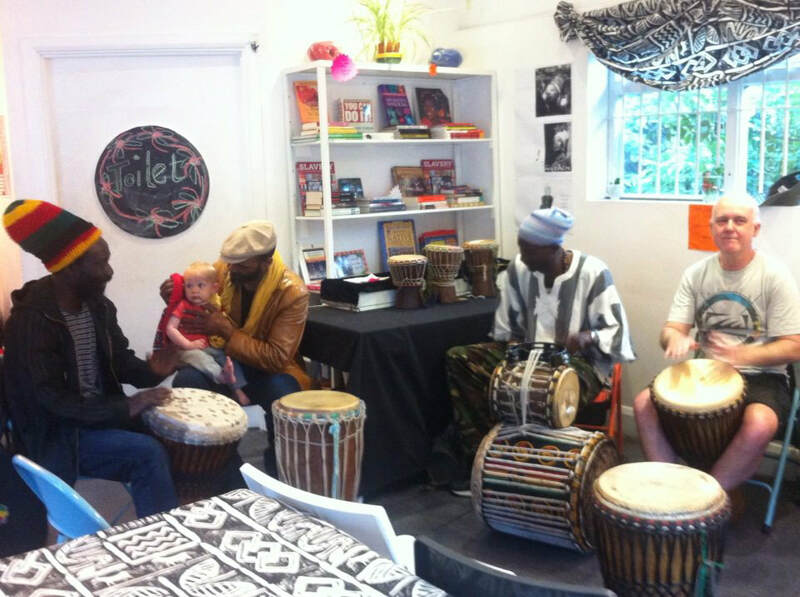 We use funding from organisations including The London Community Foundation along with profits from our commercial activities to provide free African drumming workshops and free Moroccan food workshops in Communities throughout London, particularly the South East. We also use our funding and profits to organise and present free music and dance events and free Moroccan Kitchen events for local residents of all ages. 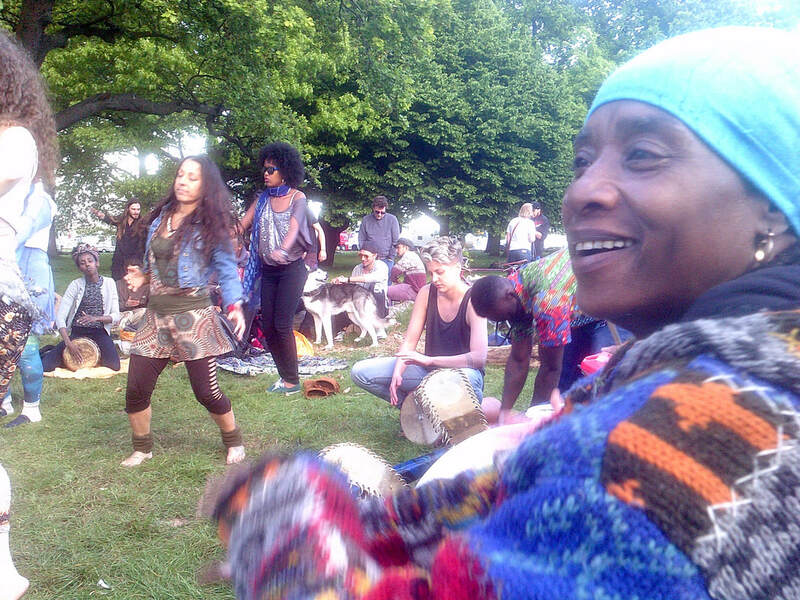 Shamha Vibration was founded by Djina Jones in 2014. Djina was born in Errachidia in Morocco and moved to London in the 1980s and has lived in Brixton since 1990. Apart from raising her family, Djina has been involved in Community activities for many years, particularly using her skills as a musician and healer to provide support for people who experience difficulties in their lives. After many years writing songs and performing with her group ‘Najat’, along with session work for many other musicians and touring with groups including ‘Co-Creators’, ‘Bluefield’, ‘Momo’, ‘Zaza’ and ‘Gnawa Blues Allstars’, Djina recognised that in the last few years in the Brixton area, there has been a real reduction in the provision of Community facilities and many projects were being closed down and local people were suffering from more and more deprivation, which was causing distress and unhappiness amongst the local population. 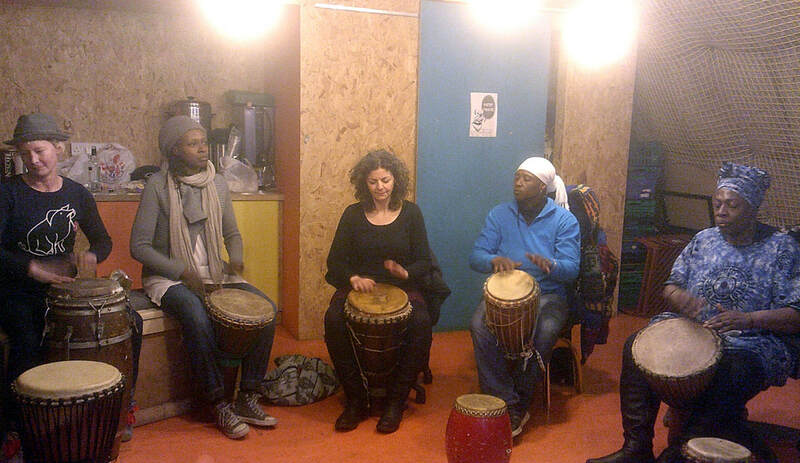 This led Djina and a couple of like minded musician friends to begin offering free African drumming classes in South London Community Centres as a small contribution to improving the local atmosphere, which came to the attention of The London Community Foundation and in 2014 the LCF offered funding for a series of drumming workshops and events. Djina was joined by long time musical collaborator Pete Phillips and for the next three years they held weekly free African drumming workshops and monthly free concerts at various venues around South London, using the funding to pay for the hire of the venues and to pay some amazing performers to appear at their Shamha African Drumming concerts. The results were remarkable, getting neighbours together to enjoy social events and not having to worry about paying for the workshops, bringing a bit of positivity into the situation. Shamha African Drumming workshop in Brixton. 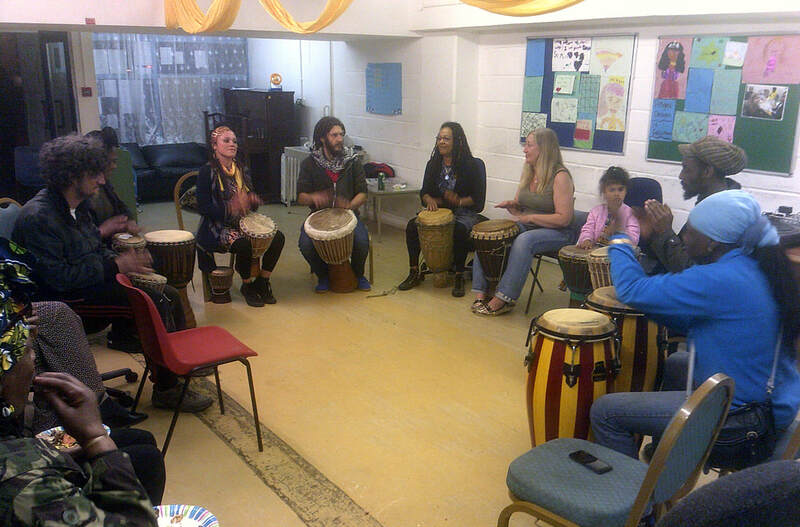 Shamha African Drumming was such a success that Djina, Pete and local Community Leader Roz Henriques together formed Shamha Vibration CIC, so that they could apply for funding and operate professionally to provide their popular classes and concerts. Shamha Vibration has been a real benefit to local people who would otherwise not be able to afford to attend drum classes or concerts. Our drum classes give people a chance to get together and enjoy the benefits of sitting together and playing drum rhythms which literally cause ‘good vibrations’ and result in a feeling of happiness and wellbeing. And the free concerts at local venues bring superb musicians and dancers to perform for the Community who can come along and have a dance and enjoy free food prepared by Djina and Moroccan Kitchen. 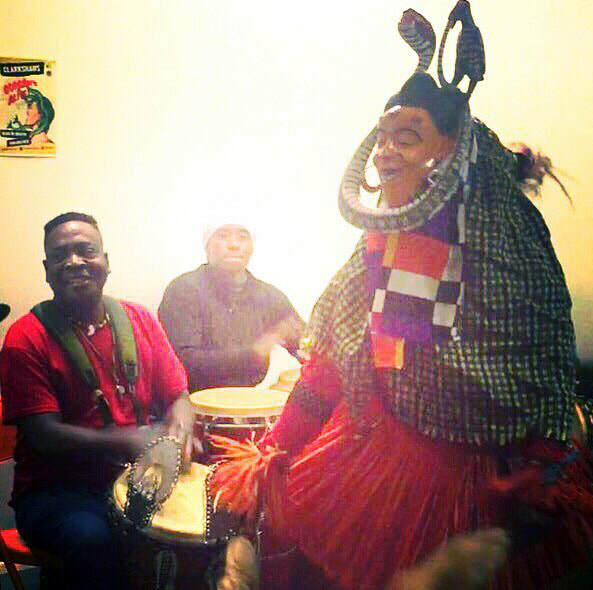 Performance with Henri GaoBi, Djina and Mask Dancer Rose. Shamha drumming session in Brockwell Park. There are many African drum styles and rhythms from across the African Continent. Some are for dancing, incredibly complex and take many years to learn and understand. Other rhythms are ceremonial or spiritual, intended to provoke feelings of excitement and transcendence, or of peace, healing and harmony. Shamha Vibration use rhythms from North and West Africa, rhythms which are quite easy to learn in a short space of time, so that our workshops are mainly spent playing the rhythms, breathing deeply and feeling the flow of energy through the body, the good vibrations, that drumming together in a circle can produce. People say that they feel ‘lighter’ or ‘happier’ or ‘less stressed’, after one of our workshops. Any one can attend our workshops. Check our Facebook page for the latest news. We sometimes have particular workshops for specific groups of people, including families, the elderly, company retreats and wellbeing workshops. You can send us a message for more information about our activities. Djina, Roz and Pete all have up to date enhanced DBS certificates along with company Safeguarding Policies and Public and Employers Liability insurance and food hygiene certificates which can be inspected upon request. Shamha Vibration CIC Registered number 10908988. Registered Company address 101 Loughborough Road, Brixton, London, SW9 7TD.